JEFFERSONVILLE, Ind. — In a luxury high-rise across the Ohio River from Louisville, Kentucky, resides one of this year’s most elusive congressional candidates. Joseph A. “Trey” Hollingsworth III, 32, listed the complex on his candidate declaration form for Indiana’s 9th District, but he hasn&apos;t been there long. He moved to Indiana in September, and in October, he got into the open race for Rep. Todd Young&apos;s seat. He has funded most of his campaign himself, and has made a splash on the airwaves in a district that boasts a five-way Republican primary. “Who else is running?” asked Mike Hall, a Jeffersonville resident who has seen television ads promoting Hollingsworth and plans to vote for him. Hollingsworth’s paid media campaign, and that of Indiana Jobs Now, an equally mysterious Arlington, Va.-based super PAC backing him, appears to be paying off. But with less than a month in the primary race, the question remains whether looking like a carpetbagger will be a liability for Hollingsworth or whether the appeal of a self-described outsider with unlimited personal resources will prevail, perhaps riding the down-ballot coattails of Donald Trump on the same May 3 ballot. In polling released Thursday by Indiana Jobs Now and conducted over two days in late March, Hollingsworth led with 28 percent of the vote in the GOP race. Attorney General Greg Zoeller, who started with the best name recognition , trailed with 16 percent, followed by state Sen. Erin Houchin at 9 percent, state Sen. Brent Waltz at 8 percent and engineer Robert Hall with 3 percent. Thirty-five percent of the 400 likely GOP primary voters National Research Inc. surveyed in a live caller poll were undecided. The survey had a margin of error of plus or minus 4.9 percent. Voters know Hollingsworth’s name, but plenty of 9th District residents with whom Roll Call spoke last week still don’t know much about him. “Who is this Trey guy?” was one refrain. Even in his new hometown of Jeffersonville, Hollingsworth remains little more than a fleeting image on television. Campaign b-roll posted on the YouTube channel of media consulting firm Jamestown Associates shows Hollingsworth and his wife walking along Spring Street — Jeffersonville’s downtown business district. 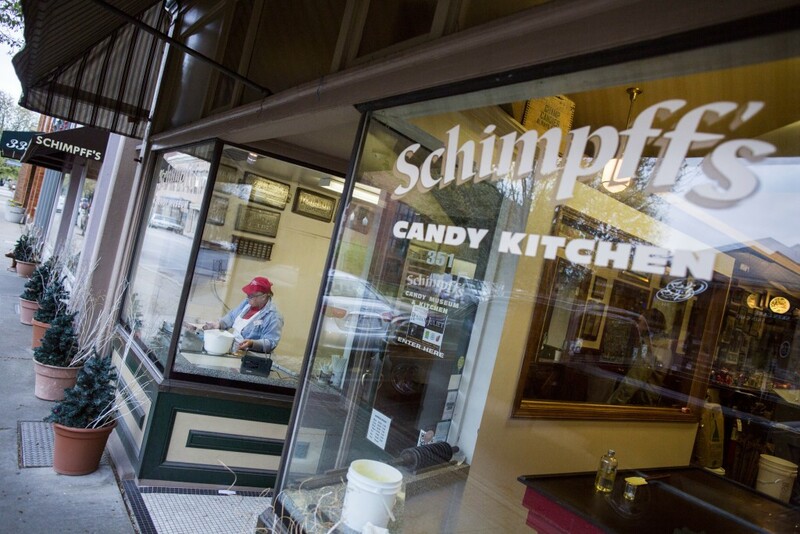 Downtown Jeffersonville is home to Schimpffs Confectionery, whose walls are lined with photos of American politicians trying their famous candy. (Al Drago/CQ Roll Call). The shop owners and customers with whom Roll Call spoke in that same area knew of Hollingsworth from his ads, but no one could recall ever seeing him in person or hearing about him in town. “I don’t know him, but when I saw the commercial, I thought, &apos;Hmm, who are you? I’ve never even heard of you before,&apos;” said Carolyn Minutillo, who owns the floral and gift shop downtown. With a population of 46,000, Jeffersonville feels like a small town connected by a bridge to a big city. It’s home to Schimpffs, a 125-year-old family-owned candy shop famous for its cinnamon red hots and frequented by American politicians, whose pictures dot the walls. Jo Stearns, a 20-year Jeffersonville resident who works at Schimpffs, has never seen Hollingsworth in town. But she&apos;s seen ads for months, especially taking notice of ones from Indiana Jobs Now that slam Zoeller as a career politician and tout Hollingsworth as "the only conservative outsider." Its latest ad suggests Hollingsworth would be tougher on immigration and fight for a border wall. Asked if that contrast would inspire her to vote for Hollingsworth, Stearns said, “It would make me consider it." 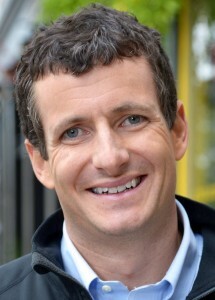 What 9th District voters don’t know about Hollingsworth, though, can’t hurt him. And Stearns sounded more hesitant — questioning Hollingsworth&apos;s knowledge of the people in the district — once she found out he’d moved to the state within the past year. Others already knew about his background. “Oh I’ve seen him on television, and I’m just really turned off by him,” Joyce Utterback, of Franklin, said at regular luncheon for retired federal employees at the Golden Corral in Greenwood, where Houchin showed up to meet voters last week. “I’m very much against him coming in our state and doing all this because I think he is edging our people out,” Utterback said. Hollingsworth registered to vote in Clark County in September 2015, but he doesn&apos;t have a record of voting in GOP primaries in Tennessee or Indiana. That raised some eyebrows in Indiana’s GOP and prompted 9th District Party Chairman Jamey Noel to make Hollingsworth sign a loyalty pledge to the Republican Party — much like the pledge Trump signed with the national party. In recent weeks, the other candidates in the race have certainly tried to make an issue of Hollingsworth’s recent arrival. 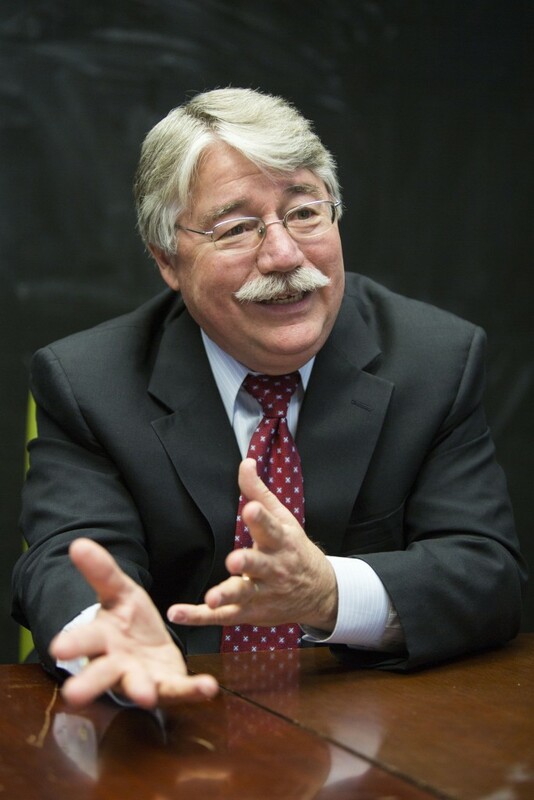 Zoeller has called Hollingsworth a “political scam artist” and accused him of having “bought name ID.” Houchin, too, has suggested Hollingsworth is trying to buy the seat. “He’s got enough money that he can make the voters believe anything he wants,” she told the Golden Corral crowd. Neither Zoeller nor Houchin has the resources to compete with Hollingsworth, or the super PAC, on the airwaves with that message. Despite the aggressive advertising, Hollingsworth contends that his campaign strategy is “talking to Hoosiers in person.” As of early last week, Noel couldn&apos;t recall hearing much from Hollingsworth in the district. But Hollingsworth has even done a good job packaging that strategy for the airwaves, with an ad showing him trudging through the snow to knock on doors and sign term-limit pledges. In mid-March, he told Indianapolis Star political columnist Matthew Tully he&apos;d knocked on 8,000 doors already. His ties to the Hoosier State, Hollingsworth argued, run much deeper than his residency history would suggest. With a warehouse real estate investment business listed in Clinton, Tenn., and an aluminum remanufacturing operation, Hollingsworth said he’s been helping create jobs in Indiana for 10 to 12 years. The move to the district, he said, was motivated by a desire to be closer to his wife’s family across the river in Kentucky before they start a family of their own. Hollingsworth, who would be among the wealthiest members of Congress if elected , responds to criticisms of his self-funded campaign much the way Trump does: He’s not beholden to special interests, and that&apos;s a good thing. But of the $8,775 he did raise in the fourth quarter of 2015, only one donation greater than $200 came from Indiana . As for outside money, Hollingsworth said he doesn’t know anything about the $221,000 Indiana Jobs Now has spent on his behalf or who&apos;s financing it. When speaking to Roll Call several hours after the super PAC’s poll came out late last week, he said he hadn’t seen it. "I&apos;m not accusing him of illegal coordination, but I think he knows because it could only be himself, his family or his close associates who are funneling the additional resources into a super PAC," Houchin said to the Greenwood lunch crowd. Hollingsworth is a friendly conversant on the phone, and when he’s not speaking in political platitudes (“I’m really excited about bringing genuine conservative change”), he’s engaging and sometimes self-deprecating. For much of this primary, Hollingsworth’s campaign has largely ignored the media. Only in the last month has a local columnist and TV station scored interviews. He may have made his media debut as a 15-year-old workaholic in a 1999 Washington Post story about teenagers at a summer entrepreneur camp. At the time, he wouldn&apos;t tell reporter Mark Leibovich what his Internet start-up was for fear someone would steal his idea. But for now, though, Hollingsworth has to stay put in Indiana. "I&apos;m a proud Hoosier," he said. — Al Drago contributed to this report. Contact Pathé at simonepathe@rollcall.com and follow her on Twitter at @sfpathe . Get breaking news alerts and more from Roll Call on your iPhone or your Android.